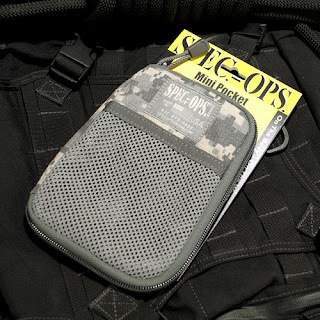 The Pocket Organizer is a general purpose organizer that is perfect to organize cargo pockets and can also be used as a belt pouch or as an organizer inside a bag or backpack. The organizer is 7'' x 4.75'' and 1 inch thick. Outside the pocket there is an external mesh pocket in one side for loose items and the belt loops with an integrated handle in the other. The handle is useful to retrieve the organizer from your cargo pocket if you use it in that way. The organizer is opened using a clamshell style zipper, once opened the interior is organized in two panels. 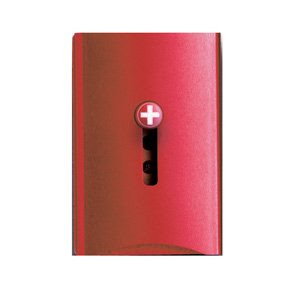 The left panel has five elastic loops useful for pens, knives, flashlights etc; this panel has a yellow background for extra contrast when you need to find something. There's also a strap with a plastic clip that can be used for a keychain , a photon style flashlight or other items. The right panel has two internal pockets that can be used for items or to attach a notepad, the 4'' by 6'' rite in the rain notepads fit perfectly. Since the organizer opens completely you can use it to write notes if you put a notepad in the right panel. The construction in cordura nylon is very strong, the zippers are very silent and run very well and the belt loops are extremely strong, you can use the organizer for heavy items without problems and it is surprising the number of things you can neatly organize inside the pouch. Available in ACU gray, black, coyote brown, olive and tan. Can be ordered for $25 from Spec Ops website. The swiss wallet is a thin and stylish minimalistic credit card holder with a money clip. The wallet is made of anodized aluminium and can hold up to five credit cards in the slot, it can also be used for business cards. One of the sides features a sliding button that is used to pop the cards from the wallet, the activation is smooth and the mechanism works well. The othe side of the swiss wallet, the one that is not in the picture has a stainless steel clip, the clip can be used as a money clip for bills or to clip the wallet to a belt, pocket or other places. It makes sense for us to use the clip for bills so you can have both cash and your credit cards in the same place. The swisswallet is stylish and very thin, it only weights 2oz. The aluminium finish is strong and does not get scratched easily. The wallet is available in red, salmon, yellow, green, blue, silver and black colors; the money clip is not painted. For the ones that like to use a money clip the swiss wallet is a great idea so you can also have some cards with minimum weight and volume. You can read more at the product page or order from Amazon for about $28. This is a keychain version of a transflash memory reader. 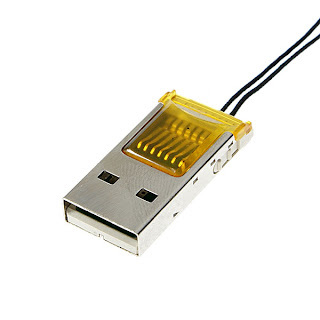 It features a USB 2.0 connector on one side and a slot for a transflash card in the other end. The dimensions are really minimal: 1.02'' x 0.43'' x 0.16'' and weights 0.2 oz. To use it you need to have a transflash memory card too, TF cards are becoming popular since they are used in many cellphones, you can plug the card, insert the reader in a USB port and access the card as a drive without drivers or aditional software. Used in conjunction with a 1gb or 2gb TF card this can be a tiny flashdrive, probably the smalles you can have since the reader is just as big as the USB connector itself so we don't see how it can be any smaller. The reader has a small hole for a strap so you can carry it on your keychain or a necklace, construction is good enough to survive your keys, there are no moving parts so unless the plastic where the TF card is inserted gets crushed the reader will work fine. Remember you also need a TF card to use this as a flashdrive. You can get it for $4.50 from DealExtreme. The Petit1 is a mini version of a fountain pen. It is as small as a cross ion and about 1cm in diameter. 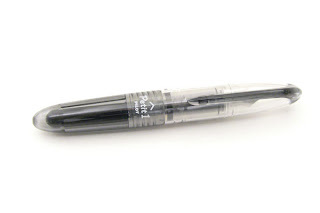 The pen has a stainless steel system and writes very well without smudges, it is one of those modern pens that makes hard to know if you are using a fountain pen or a gel roller. The nib is fine and the ink flows smoothly without getting dry. The pen uses ink refills, they can be refilled if you want or you can't get a replacement with your favourite ink using a syringe. The body is nice to the hand and with the cap at the back the size is very good for writing. The cap clip is a little fragile so don't use it for a pocket. For its price this is an excellent EDC writing tool if you like fountain pens, it is very affordable, writes very well and it's amazingly small. You can order from JetPens in several different colors for $4.50. Make sure to get some refills too (3 for $2). 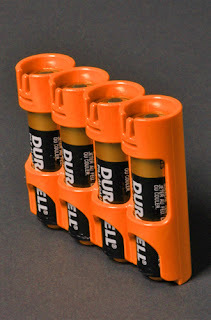 This is a line of battery cases available in many different presentations, colors and sizes for different battery types. We'll review the slim line because it is the most suitable for EDC. There are 6 models in the slim line: 4xAA, 4x123, 6xAAA, 4x9v, 4xC, 4xD. Each model is available in different colors: GITD, orange, yellow, clear, red, green and black. The caddy is constructed in solid plastic, each battery is well protected and locks in place with a small plastic tab, inserting and removing batteries from the holder is easy and the locking mechanism seems to be strong enough to be used thousands of times. Both the positive and negative contacts of the batteries are protected to prevent shorts. The finishing of the product is of high quality, there are no sharp edges or pointy corners so you can put them in your pocket or inside a bag without any problems. The colors are bright, the glow in the dark version charges very well and glows bright for the first minutes with a glow enough to find them in complete dark for several hours. There is no attachment point for a splitring, lanyard or a clip so you have to just drop the caddy inside a pocket or bag. If you need to carry spare batteries the Personal Battery Caddy is a very high quality product with many versions available and will do exactly what you expect it to do: hold and protect your batteries. You can read more, find about the other versions and order from the official website.